At Kessler Eyecare we offer comprehensive eye exams to residents of Wichita, Derby, and Goddard, KS. Our eye exams can diagnose and help treat any eye disease you might have. It is important to take care of your eyes and our complete eye exams are just what you need. Regardless of your age or physical health, Dr. Joseph Kessler, Dr. Whiteney Scott, Dr. Ashley Craven, and Dr. Thien-Lan Nguyen encourage you to have regular eye exams. 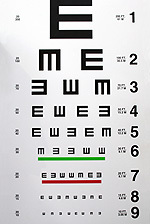 During a complete eye exam at our Towne West Square or Towne East Square office, your eye doctor will not only determine your prescription for eyeglasses or contact lenses, but will also check your eyes for common eye diseases, assess how your eyes work together as a team and evaluate your eyes as an indicator of your overall health. Our comprehensive eye exam in Wichita includes a number of tests and procedures to examine and evaluate the health of your eyes and the quality of your vision. These tests range from simple ones, like having you read an eye chart, to complex tests, such as using a high-powered lens to examine the health of the tissues inside of your eyes. Our Wichita office provides comprehensive eye exams for children. These exams help to discover the eye health condition of your child's eyes and give the best treatment possible.